The song was re-released in 2010 as a single from the . View 2010 information here. 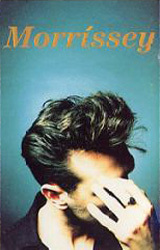 Morrissey, photographed by Russell Young. A different photo from the same session is found on the back (view left). 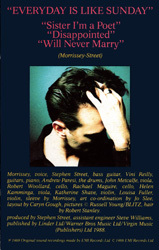 UK: This single was promoted in the UK with the help of the second in a series of promo 12"s in glossy record bags of different colour. 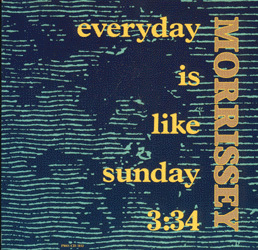 The "Everyday Is Like Sunday" bag is grey (EMI 12POPDJ1619; view left). A one-track promo video was also distributed to the relevent media. Australia: A one-song promo 12" of "Everyday Is Like Sunday" has been reported, but this is unconfirmed and actually highly unlikely. 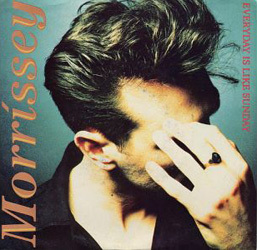 Brazil: The Brazilian "Everyday Is Like Sunday" promo 12" served to promote the "Viva Hate" album, as the song was not released as a single in Brazil. 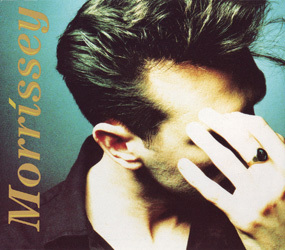 Canada: Gold stamped copies of the 12" were sent to radio and record stores for promotion. 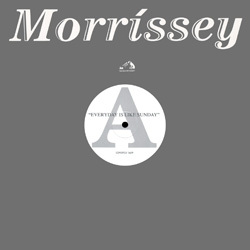 A promo 7" (Sire/Reprise, 92 78377) was also specially pressed and distributed inside a generic record label sleeve, despite that single not being available in that format in Canada. 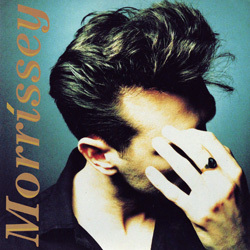 Unlike the USA promo 7", this one is backed by the usual b-side "Disappointed". Germany: Copies of the EEC 7" were sent for promotion in Germany with a 'fact sheet' in German. Italy: Copies of the stock 12" with the sleeve punched with the words 'campione gratuito' were used for promotion. 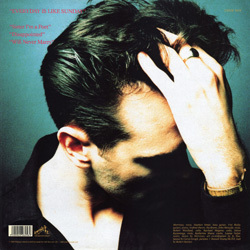 South Africa: One-sided promo 7"s (PS103) were pressed very likely for promotion of the "Viva Hate" album because "Everyday Is Like Sunday" wasn't released as a single in that country. Spain: Copies of the stock 7" were stamped in ink on the sleeve. 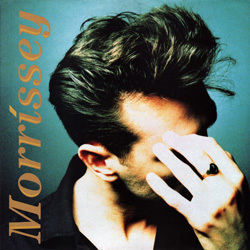 USA: Gold-stamped copies of the 12" and a promo 7" (Sire/Reprise, 7-27837-A) were sent to radio for promotion of this single. The promo 7" has the title track on both sides. 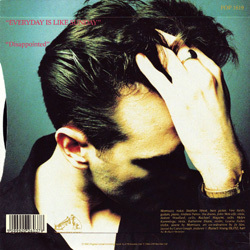 A one-track promo cd of "Everyday Is Like Sunday" was also sent to radio, but this item was used mainly to promote "Viva Hate" and is discussed on that album's discography page. 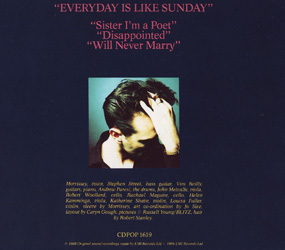 The video for "Everyday Is Like Sunday" was included on a Warner various artists sampler compilation dated 6-28-88 (A80850) as well as on issue #341 of the ETV various artists promo videos series, issue 65a of the various artists Telegenics promo videos series, the August 1988 issue of the Rockamerica promo videos series.